Today I wanted to celebrate my love of spicy food with some homemade, wasabi roasted chickpeas. 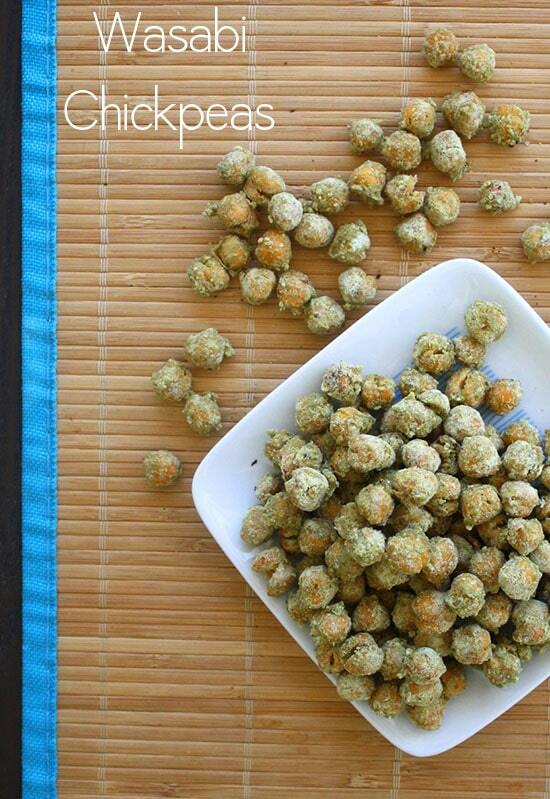 Spicy, salty, and slightly sweet wasabi roasted chickpeas are a great snack or salad topper! Someone told me once that spice was addictive. You start out liking food just a little bit spicy, and over the years you need spicier and spicier dishes to get your fix. I think I believe that. At least in my experience, I feel like it’s true. At this point, when I add hot sauce to a plate of food, folks who don’t know me think the amount was an accident. It wasn’t. 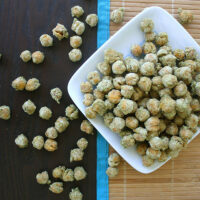 These wasabi roasted chickpeas aren’t as atomically spicy as some of the foods I like, but they’re nostalgic to me. 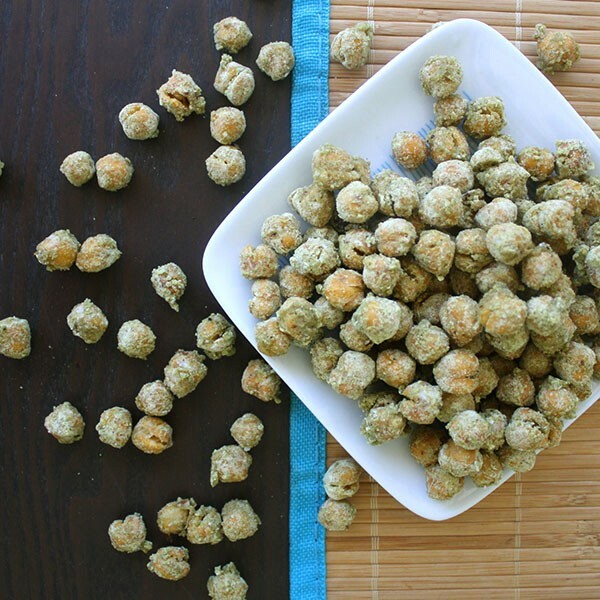 Even as a kid, I loved snacking on spicy, crunchy wasabi peas. When I saw today’s Vegan Mofo writing prompt, Share Your Favorite Cuisine, this dish sprang immediately to mind. Does “spicy food” count as a cuisine? I hope so! Whether it’s India, Thai, Japanese, or more conventional American type food, I like it all better doused in hot sauce. My friend Liz and I kind of collaborated on this recipe. She’s wanting to make her own wasabi peas. In her research, she read that heating wasabi kills its heat. That is why you don’t want really high quality wasabi powder for this recipe. Choose one that has mustard powder in it, as well. I used Eden Wasabi Powder, which contains wasabi, mustard powder, and horseradish. I can’t vouch for the results with other wasabi powders, so let me know if you branch out! This recipe is adapted from one that my coworker Jeannie Moulton shared long ago on Eat Drink Better. Her recipe was for wasabi peanuts, and it used egg as the binder. I thought it would be super fun to convert her recipe to one for roasted chickpeas and use aquafaba from the beans as the egg replacer. Something about that seemed super fun to me. I guess whisking aquafaba is how I party these days? 1 15 ounce can chickpeas - Drain, but save the liquid from the can. Line a baking sheet with parchment paper or a Silpat, and spread the chickpeas onto the sheet in a single layer. Bake for 35 minutes. Remove from the oven, set aside, and reduce the oven temp to 200F. When the chickpeas are done baking at 400F, whisk the chickpea liquid with a fork in a large bowl until it becomes foamy. Add chickpeas and toss to coat with the whipped chickpea liquid, then drain off the excess liquid in a colander. Stir together wasabi powder, salt and cornstarch in a small bowl. Transfer the chickpeas back to the large bowl, and toss to coat with the wasabi mixture. Spread chickpeas on baking sheet in a single layer, and bake for 20 more minutes. Is parchment paper on the baking sheet when the coated chickpeas are returned to it? Yes, you should leave it on there. Are the chickpeas supposed to be rinsed as well as drained? The aquafaba is really thick and is tuck to the chipeas pretty well in my can. I do not rinse them. The aquafaba will act like egg whites and help the coating stick! Are these supposed to be crunchy? Mine are soft, even after baking an extra 10 minutes at 200 degrees. 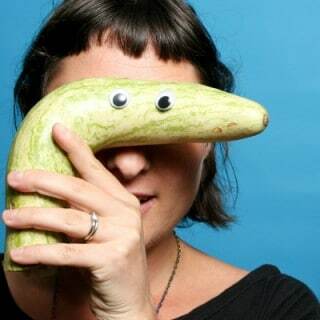 Oh weird! They should be crunchy. I wonder what happened! The only thing I can think of is I whipped the aquafaba to much. It was very frothy and there wasn’t anything to drain. The taste is good so I’ll have to try them again. Another thing, I wasn’t sure if the sugar was a mistake since you have it in the ingredients but not in the directions. Oh whoops! No, sugar should totally be in the directions. That’s interesting about the whipping! If you try again, let me know if less whipping works. I can add that to the instructions to help other folks! I’m wondering if it’s the altitude? I baked mine extra long. It could be! How long did you bake?